Take better control of your dog’s wellbeing and health with a dog allergy test. Allergy testing is important for any dog owner who has their dog’s best interest at heart as it can make managing allergies easier and provide allergy mitigation strategies that can result in happier and healthier dogs. The dog allergy test starts from just $99. Common environmental allergens are found everywhere and food allergens will be often found across many dog food brands – for the canine sufferer, their life can be rendered miserable, resulting in very poor health, a lack of energy, mood changes etc. Common environmental triggers include fleas and dust mites as well as moulds and pollens from trees, grasses, weeds and flowers. Allergies are caused by an overactive immune system that perceives harmless substances as threats. This triggers a reaction which can include any of the common symptoms we associate with allergies such as itching and sneezing. View the full list of allergens tested for in this test. A dog allergy test is a powerful tool to determine what exactly is causing your dog’s allergies. This dog allergy test will not only provide you with a list of the allergens that are making your dog unhappy or triggering their allergic reactions. The results also provide details about the foods and supplements to avoid at all costs and some important guidelines as to what household products, food, treats and supplements can be beneficial for your dog or for which he or she shows no allergic reaction to. You will also have detailed information about the allergens your dog tested positive for and include dietary and lifestyle guidelines such as the use of corticosteroids, elimination diets, topical treatments, supplements; like probiotics and Omega-3 oils- and much more. You can collect samples for this test using our home sample collection kit. We will send out your kit once we have processed your order and you may collect samples quickly and painlessly from your dog following the instructions in the kit. View sample collection by clicking here. The Dog Allergy test is not a DNA test. This test uses the proteins in the dog’s system to help you learn the sensitivities your pet may be experiencing so you can have a better understanding of what they may not be able to tolerate. There are a number of options available to deal with these sensitivities. We recommend discussing them with your veterinarian to find the solution that is best for you. This can include introducing a new diet to your canine or eliminating certain foods and medications. The price of the Dog Allergy test is $99. A second or third Dog Allergy test for your other dog or maybe for a relative or a friend can be purchased at $89 ($10 discount). You can also benefit from a $14 discount if you decide to order a Dog Breed Test (priced at $79) with your Dog Allergy test. In addition, we are offering our clients the opportunity to purchase a premium package priced at $195 including 3 Dog tests, the Dog Genetic Age test, Breed test and Allergy test. Make use of our discounted prices to understand even better your beloved pet! – What are the most typical allergens? 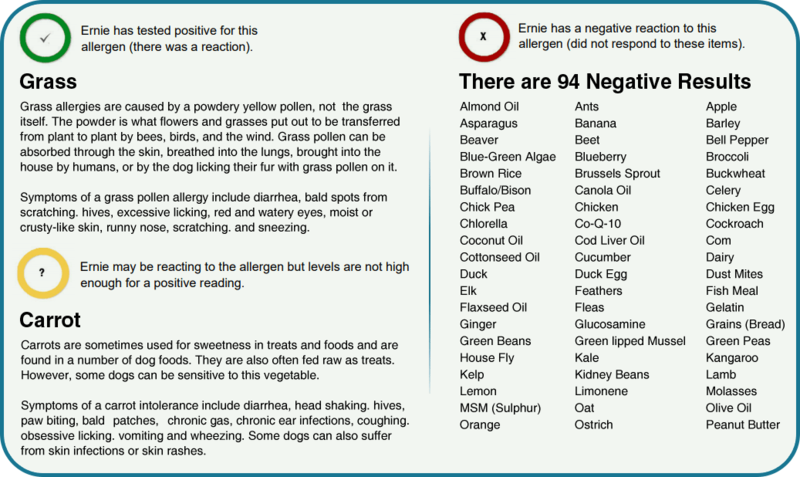 – What are the most common symptoms that are commonly exhibited in dogs with allergies? – Do different dog breeds suffer from different allergies? Yes, different dog breeds may be more susceptible to specific allergies. The following are some breeds that are sensitive to issues with food and/or airborne allergies: Maltese terrier, Pekingese, German Shepherd, Bull Terriers, Bichon Frise, English Cocker Spaniel, Brussels Griffon, American Hairless Terrier, Bohemian Terrier, Shih Tzu, Lhasa Apso, American Pit Bull Terrier, Wire-Haired Fox Terrier, Chinese Crested/Powderpuff, Poodle, Irish Setter, English Bulldog, Pugs. Are you interested to find out the breeds making up your dog? Take our Dog Breed DNA Test today. – How can allergies be treated? Allergies can be managed by avoiding the allergens which trigger the allergy. It is also possible to manage the allergies through the use of medication or medicated shampoos – however, many times such treatments only mask a problem without finding the root cause. Importantly, allergies cannot actually be treated but rather managed – if a dog has an allergy, there are no actual cures that will make that allergy disappear. Do you still have some unanswered questions? Head to our FAQ page for more information.